The Build Melton Hospital / Invest in the West campaign has received an enormous 11,000 signatures of support in the first four weeks. 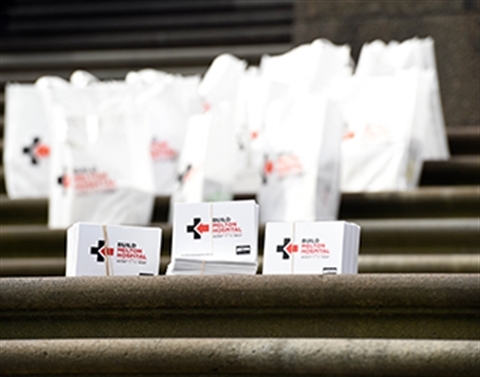 A delegation, led by Mayor Cr Bob Turner, delivered 11,000 postcards to the State Government at the steps of Parliament House, demonstrating widespread community support for a hospital in Melton. Melton City Council Chief Executive Kel Tori, as well as a number of doctors from the City of Melton, joined Cr Turner to present the postcards to Spring Street. Cr Turner said that he was incredibly proud of everyone in the community who had shown their support for the campaign over the past four weeks, but said the campaign was just beginning. “Receiving such incredible support in only four weeks exemplifies how desperately people in the community want a hospital,” Cr Turner said. “This sends an undeniably strong message to the decision makers at Spring Street that the City of Melton, and surrounding communities, want the State Government to Invest in the West, and Build Melton Hospital". “It is unacceptable that our residents have to face travel times of up to an hour just to reach a hospital, let alone waiting hours and hours in the emergency department before they are seen by a doctor. “We have delivered 11,000 signatures in support of the campaign, but we are only just getting started. Cr Turner is calling on the community to access buildmeltonhospital.com.au and sign the online petition, and to sign up receive regular email updates on the campaign. Anyone wanting to find out more about the Build Melton Hospital: Invest in the West campaign is also encouraged to like the Build Melton Hospital Facebook page for updates.